Why do I need to know how old my tent, awning or canopy is, when ordering a new pole, tube or part? Many of our tents and awnings change pole or tube size from year to year. As such all Force Ten, Vango and Lichfield tents, awnings and equipment have a year code label, which identifies the year of launch. The label is white, approx. 6cm x 4cm, and is generally found inside the inner tent, located next to or under the large fire precaution label. It can also be found on the flysheet or swing tags attached to the tent bag. On awnings; inside the door / at the bottom seam or swing tags attached to the awning bag. Please note Force Ten, Vango and Lichfield tents & awnings could be produced a few months in advance of the year they go into store, as such please do not use the "date of manufacture" as an indication of the year of your tent. The first 3 letters denote the year. How do I replace my new Airspeed tube? How and when will my purchase arrive? We aim to process your order within 3 - 5 working days. For items over 2kg we ship via Parcel Force express 48 hour service, these deliveries need to be signed for so please keep this in mind when entering a delivery address. We can ship to your work address no problem. Lightweight items will go via royal mail. The photo of the poles do not match my requirements? Many of our photo's are standard shots. Please go by the item title. 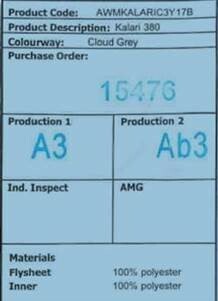 The original specification is shown on the product description, however in some cases we are not able to replicate the original colour coding. How do I assemble the pole sections once I have purchased? Fibreglass poles are made up of a number of sections and an elasticated cord. The cord runs through each section and is simply knotted at either end. 1. Untie the knot at the end of the pole. 2. Remove the sections one at a time until you reach the section that needs to be replaced (when it is time to re-assemble the pole it is important that the sections are put back in the same order). 3. Measure the section which is to be replaced (the new section will need to be cut to length). Cut the new section to the length measured. We would recommend using a small hacksaw. Once cut, the end should be filed smooth. 4. Re-thread the cord back through the sections and tie a knot at the end. Alloy poles are made up of a number sections, and an elasticated cord and end pieces. The cord runs through each section and is simply tied to the "end piece" at either end. 1. Pull out or unscrew the "end piece" and untie the knot at the end of the pole. 2. Remove the sections one at a time (holding onto the cord) until you reach the section that needs to be replaced (when it is time to re-assemble the pole it is important that the sections are put back in the same order). 3. Measure the section which is to be replaced (the new section will need to be cut to length). Cut the new section to the length measured. We would recommend using a small hacksaw. Once cut, the end should be filed / sanded smooth. 4. Re-thread the cord back through the sections and tie a knot at the end piece, and re insert.